July 29, 2013 - UPS released its annual Sustainability Report announcing that while the total number of packages shipped in 2012 increased, the company reduced its total Greenhouse Gas (GHG) emissions. Environmental achievements included ground and air fuel savings, increased investments in alternative fuel vehicles, and retooled routes that shaved 12.1 million miles from ground deliveries. "UPS also set a new alternative fuel goal," said David Abney, UPS Chief Operating Officer. "By 2017, the company will reach one billion miles driven by alternative fuel/advanced technology vehicles - more than double the previous 400 million mile goal." For the second year in a row, UPS earned superior credentials for reporting transparency a Sustainability Report that fulfills the Global Reporting Initiative's requirements for an A+ level as well as third party assurance of its report and greenhouse gas data from Deloitte & Touche. Less than 20% of all GRI Sustainability Reports are A+. "Our industry-leading accomplishments showcase innovative technology and global operational efficiency gains as well as world-class credentials for rock-solid data," said Scott Wicker, UPS Chief Sustainability Officer. "The report's theme, More of What Matters, sharpens UPS's focus on how to make the most measurable positive impact through sustainability business practices and logistics expertise." 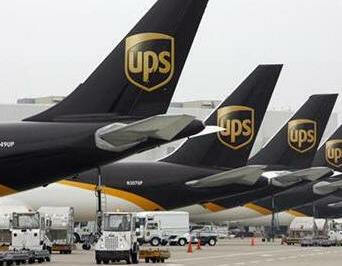 In 2012 UPS Airlines, which represents 57 percent of UPS's carbon footprint, reduced its fuel use and carbon production. Air shipping volume rose 4.8 percent year over year, while fuel use dropped 1.3 percent. One of the cornerstones of UPS's environmental strategy is to support the development and use of lower-emission alternative fuels. Vehicles represent approximately 35 percent of UPS's carbon footprint. UPS is accelerating its testing, purchase and deployment of new-generation vehicles. Between 2000 and the end of 2012, the alternative fuel/advanced technology fleet has logged 295 million miles with an ambitious new goal of 1 billion miles set for 2017. In 2012, this growing fleet drove 49 million miles, a 43 percent increase compared to 2011.